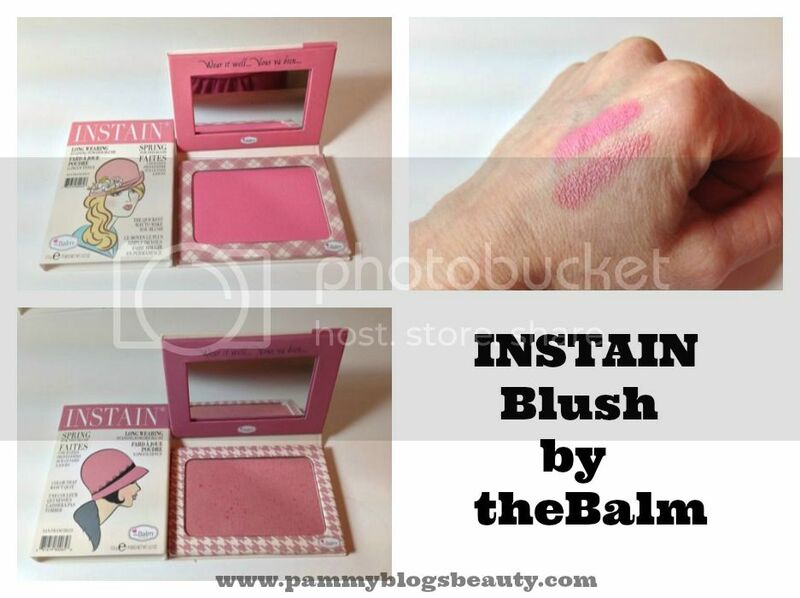 Pammy Blogs Beauty: Blush Crush: INSTAIN Long Wearing Blushes by theBalm! Blush Crush: INSTAIN Long Wearing Blushes by theBalm! It is no secret. I have a bit of a thing for blush. For me, it is the makeup item that gives me that "ahhh" moment. It perks up my complexion, gives me color...even my application method (smiling when I put it on so that I get the proper blush placement on my cheeks) makes me happy. :) Point being: I <3 Blush! So, I am always excited to try a new one! Next to palettes, blush is the makeup item that I am always the most excited to try. Well, I have a new "Blush Crush"! 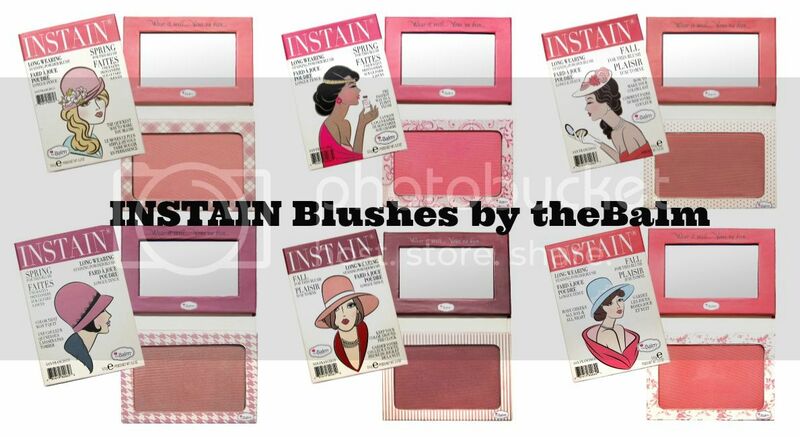 TheBalm recently released a new collection of blushes: the INSTAIN Long-Wearing Powder Blush. These blushes looked so pretty that I just had to try a few out! One of my favorite beauty sites, Birchbox, just added INSTAIN Blushes by theBalm to their online boutique. As a Birchblogger, they asked me to review a few blushes for you! Here is what Birchbox has to say about these fabulous new blushes: Naturally flushed cheeks are a great way to look fresh and healthy, but in the heat of the summer, pretty cheeks can quickly turn streaky and glaring. Avoid the latter with theBalm’s InStain Long Wearing Powder Staining Blush. The buildable formula comes in a range of flattering, natural-looking hues that stand up to heat and humidity. To find out how I like theBalm's new INSTAIN Blushes in Argyle and Houndstooth, please click "read more" below. INSTAIN blushes are a powder formula blush that leave behind a "stain" on your cheeks. The only other blush that I have tried that is similar is IT Cosmetic's Vitality Cheek flush blushes (which are also a powder formula stain-type blush). If you missed my review for IT Cosmetics's Vitality Cheek Flush, be sure to check that out here. I must say that powder/stain blushes are now my favorite and certainly my preferred formula for a blush. Before diving into talking about formulation and pigmentation, lets talk about this adorable packaging!!! As usual, theBalm has "hit-the-ball outta the park" with its cute packaging, catchy product name, and overall product presentation. The blushes are housed in think and sleek cardboard compacts with a magnetic closure. Each comes with a matching cardboard sleeve (just like the Balm's other blushes). The inside features a product-sized mirror and the blush pan. I am always a fan of travel-friendly packaging! Even though the blush pan is sizable, the packaging itself is completely non-bulky and travel friendly. This blush would easily slip into your purse or travel bag. With this size, you could toss a handful of blushes into your travel bag and still have plenty of room for your other makeup items. Adorable packaging aside, how is the formulation? The silky powder leaves behind a lasting stain that blends in seamlessly with your skin...Swipe on a single layer for a subtle look, or carefully build up the color for a more visible hue. These blushes are so pigmented! Just a slight swipe of my blush brush gives me the perfect amount of color. I find that using a light hand is the key with these INSTAIN blushes. I mean, they stain! ;) The formula wears all day on my combo skin with no problem! Swiss dot, a fresh tangerine. These INSTAIN blushes by the Balm are available at Birchbox for $22 each. Have you tried theBalm? What are some of your favorites? As always, thanks so much for reading!!! I Have tried & LOVE theBalm, I have some of their palettes, I also own the Hot Mama Blush, which is more like a Highlighter on me and I don't know why because I am fair skinned. I really want theBalm Frat Boy Blush and the Instain Blush in Swiss Dot because I've really been into peach blushes for the summer time. @IceQueen81-I totally want to try that shade, too! @Maria Cardoza-The Balm really does have amazing palettes! I have Hot Mama blush too and like it. Such cute packaging. My favourites are Toile, Argyle, and Lace. They look like they'd work for my skintone.